Right now, everything appears to be alright. You are walking hand in hand with your beloved girlfriend through a beautiful park (ignoring the fact that the skies have turned green). But then, a punky guy comes across, punches your face and runs away with your girl. Of course, you try to save her. And you will, untol Mohikan knocks you out again, and it's your job to save her over and over again. 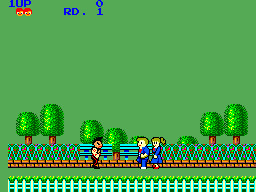 It's a nice run-jump-and-beat-em-up game. Nothing very original, but still well done. 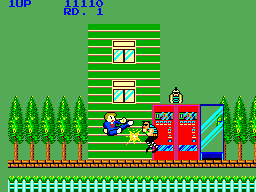 You walk from the left to the right, trying to kick thousands of enemies from the screen. And you're literally kicking the enemies of the screen - when you hit them, they fly up in the sky. But constantly they are respawning, running and jumping at you, throwing bottles, knifes and bombs. There are even dogs, spitting frogs and RC cars. There is almost no place where you can rest. As I said, your opponents are constantly respawning. At the end of each level you have to fight on a single screen the overlord Mohikan. After you defeated him (which will make him cry! ), he will knock you over and the next level start. When you have visited all three levels the game will start over, but with slightly increased difficulty. Everyone is complaing that the heaven is green. Well, that IS strange, but it never bother me. On the upscale the sprites are nicely done, the frogs (you know 'em from Alex Kidd) and the dogs are cute. The scrolling is pretty smooth and nothing to complain about. The music really has a catchy tune. Though it repeats after a while it always makes me him along it. Very well done. In most cases the kick jump will suffice, but at some places you need to think which attack will work best. And when fighting with Mohikan a good combination of all attacks is the key. 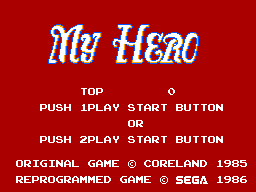 First, let me admit that this was one of my first games I had for the Master System. So, I might be biased. And, yes, the game is pretty hard. But if you are persistent enough to master it, it really is fun to play. Whenever you die, it is your fault and by practise it is possible to overcome every obstacle. Although, if you didn't play the game in the old days you probably won't be willing to invest the practise. Thus it is difficult to judge the replay value. For me it's a nine. I really like it - but I played the games so many times I get pretty far in the game. And the music and graphics always make me sentimental. On the other hand, everyone who didn't spend so much time with it will complain about the high difficulty. I love it. You maybe won't. But if you are seeking for a REAL challenge then give this game a try and save Remy out of Mohikans hand - over and over again. Maybe you will love it like I do.